Edited by Nick Aikens, Thomas Lange, Jorinde Seijdel, Steven ten Thije. Text by Nick Aikens, Christina Aushana, Zdenka Badovinac, Manuel Borja-Villel, Tania Bruguera, John Byrne, Jesús Carrillo, Christina Clausen, constructLab, Lara Garcia Diaz, et al. Essays tackling an age-old question: Can art change the world? Is art only art insofar as it refuses to be useful? At a moment when the boundaries between public and private have been radically redrawn—politically, economically and culturally—how do we understand art’s ability to know the world, to develop our ethics, to express our sense of historical belonging and to be, in different ways to different people, useful? What’s the Use? takes as a starting point the premise that art is best understood in dialogue with the social sphere, and examines how the exchange between art, knowledge and use has historically been set up and played out. 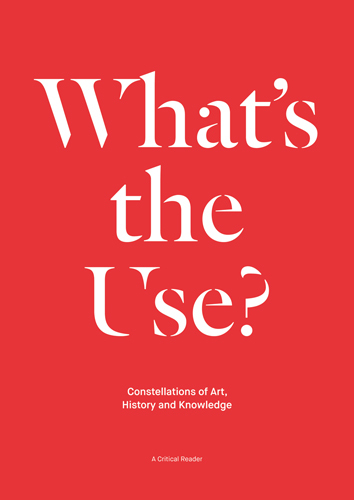 Propositional and speculative—and deliberately inconclusive—the theorists and artists included in this volume seek an answer to a familiar question: how can art know, and change, the world?